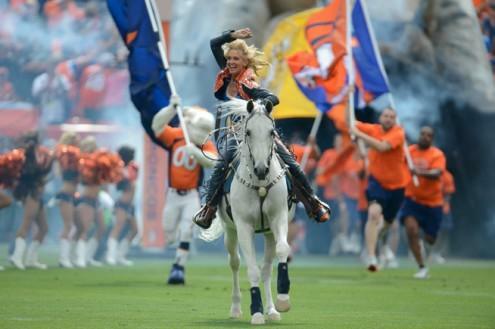 Thunder, a 20-year old Arabian gelding, is the Bronco’s mascot. Okay, I’m not a football fan. In fact I probably couldn’t tell you who was playing in the Super Bowl if it weren’t for the fact that the Bronco’s mascot is an Arabian horse named Thunder. There has been more than one Thunder. The current one, is actually the second Thunder, and he is entering is tenth year as mascot. The “new” Thunder is a 20 year old, purebred Arabian gelding who stands a diminutive 14.3 hands — at least he’s small compared to some of the human Broncos! He leads the team out of the locker room at home games in the Mile High City and gallops up and down the field every time the Broncos score. The original Thunder was an Arabian stallion whose registered name was JB Kobask. He was the Bronco’s mascot for 11 years before retiring at the age of 21. There’s actually a third Thunder in the wings, training to take by appearing in pre-season games and charity events. Thunder is trained and ridden by Ann Judge-Wegener of Thunder Spirit LLC. I think Thunder is the version of horse every little girl who ever dreamed of having a beautiful Arabian pined for.